I had every intention of starting a postpartum exercise routine soon after I went back to work. I told myself I should be able to workout for 30 minutes a day. That's easy peasy despite the fact that people told me otherwise. Well, it didn't happen simply because it's impossible to fit in exercise time with 2 kids. I tried to work out after the kids go to bed but couldn't keep up with it. A few weeks ago, I've decided to make a change and give lunch-break exercise a shot just to see how it goes. I am happy to report that I am loving it so far. It makes such a huge difference in my productivity for the rest of the day. While the gym may not be the place generally associated with looking your best, wearing stylish, functional and appropriate clothes can motivate yourself to exercise more. Dressing appropriately is even more important in a workplace. Thanks to Albion Fit for sending over this insanely soft tee. This top is very light-weight and has plenty of stretch. I especially love the thumb-holes. They're so adorable and keeping my arms warm when running outside. Surprisingly, the sleeve length is perfect for my shorter arms! The length, however, is a bit on the longer side for me. To shorten the length, I simply tied the bottom in a knot =) If you're looking for a new brand specialized in women’s fitness clothing and swimwear, definitely check Albion Fit out. They generously offered to giveaway either their classic racerback or go long crew to one lucky reader of SydneysFashionDiary. I will have the giveaway up in the next couple of days. If you're interested, please look out for it on Wednesday. - 3 sets of 12 reps using the shoulder press machine: This machine is a great way for beginners to start developing strong shoulders and arms. 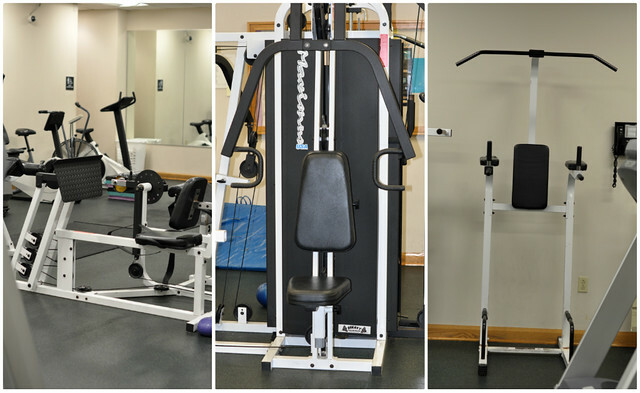 - 3 sets of 12 reps using the power tower: This equipment lets you strengthen your upper and lower body without making you lift bulky weights. Readers, do you have a workout routine? If so, I'd love to hear. I love this purple color on you! and those tennis shoes look awesome! That's pretty neat that you can fit in some exercise time at work! I'm only allowed a 15 minute walk in the parking lot at my workplace...which usually turns into 5 minute walk...because I always need to use the restroom during my breaks, haha. you look amazing ! I totally know what you mean, I only have one toddler but I can never find time to work out. Props! & I Love your fitness outfit. We have a similar routine. I run on the treadmill for 30 mins and then weight lifting with 5 lbs bells. i was planning on putting a post together about workout stuff, too. thats crazy that you fit it in at lunch. i have tried in the morning (as early as 4) and at night. i just finished my crossfit groupon, so i think i'll try to do similar workouts at home until it gets nice enough outside to run. you look great in that gear, btw! omgosh you are toned though your arms look amazing!! and you're saying you're not following your routine that well hahaha.. i feel so guilty now -___- definitely wanting to get back into zumba 3 times a week! argh so hard to be consistent!! Look at you, braving the cold, and you actually run outside? I tried that earlier this year, but the wind, cold, rain, etc just keep me indoors! I've tried motivating myself to run at lunch, but no luck. Hubs and I are going to join a gym this week, and run together, so that'll be a great boost. I love your routine that gets ya done in an hour, even with showering! WHOA! And you look great! Wish I looked like that without exercising! you look amazing Sydney, I miss working out since I started my new job. I think it took me awhile to actually lost all baby weight off. I really cant believe it has been 5 months already since u had your baby!!! wow, she's ur going to be planning her first bday before you know it. I hope you have a wonderful week!!! !